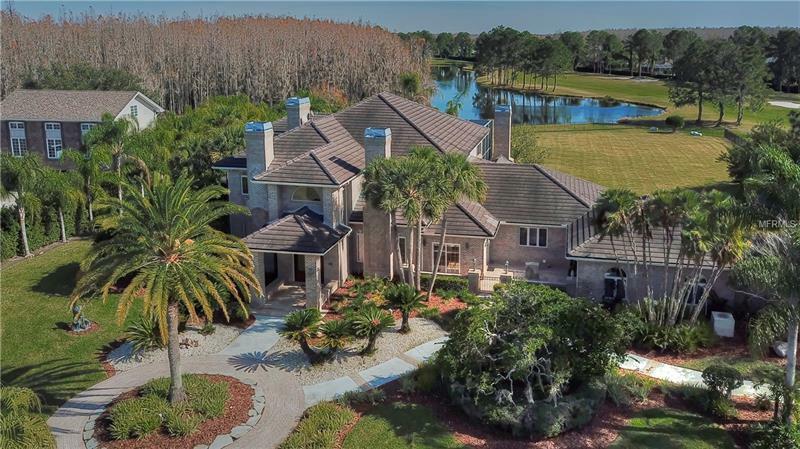 18607 Avenue Monaco, Lutz, FL.| MLS# T3153922 | Westchase Real Estate - Westchase FL Homes For Sale - Westchase Local Experts. Custom ESTATE-all the details expected in an Alvarez home.Hidden rear entry 3 car garage adds to curb appeal of this lushly landscaped brick home.Step through double wood/leaded glass doors into foyer with appreciation for detailed high ceilings;beaded boarding, double tray w/crown, boxed to sunburst designs.Formal living & dining rooms-each w/wood burning fireplaces-gaze through family room to rear French doors with view to pavered lanai w/pool/spa.Granite columns decorate the stunning screened in entertaining area overlooking LARGE fenced in backyard, pond, conservation & private Cheval golf course with great privacy.Outdoor grilling area, pool bath & spiral steps to balcony add to inviting setting.Family Room w/wood burning fireplace open to dinette/kitchen w/staggered crown cabinets, walk in pantry, granite counters w/bar, Thermador cook top in island, SS double ovens.Separate tv room adjoins family room w/access to lanai.Intimate wine room is perfect for the discriminating.Downstairs master w/wood burning fireplace has large walk in closet & newly decorated bath.Office w/private patio, utility room & 1/2 bath complete the 1st floor.Beautiful wide stairway from foyer + back stairway lead to 2nd floor loft.Three bedrooms upstairs w/French doors open to screened balcony overlooking pool, 1 w/private bath & 2 share a jack & jill;2 bedrooms have walk in closets.Sound proof room to use as exercise room or music/practice area, Or??? Four a/câs newer w/one in 2019:Newer roof.Flooring is travertine, wood & carpet. Courtesy of Mihara & Associates Inc. Copyright © 2019 Mid Florida MLS. All rights reserved. The data relating to real estate for sale on this web site comes in part from the Internet Data Exchange Program of Mid Florida MLS. Information provided is for consumer's personal, non-commercial use and may not be used for any purpose other than to identify prospective properties consumers may be interested in purchasing. Premier Choice Properties, Inc. participates in the MFRMLS Internet Data Exchange (IDX) program, allowing display of other MFRMLS broker's listings on this site. However may not include all listings currently available. Information is deemed reliable but not guaranteed. Information last updated at 2019-04-21 15:03:01.